HARDIN CO. (KTRK) -- Authorities in Hardin County have issued a Silver Alert for a missing senior. William Gant Sr. was last seen at 3pm on Saturday in Kountze, Texas. He was wearing a denim shirt, blue jeans and boots. 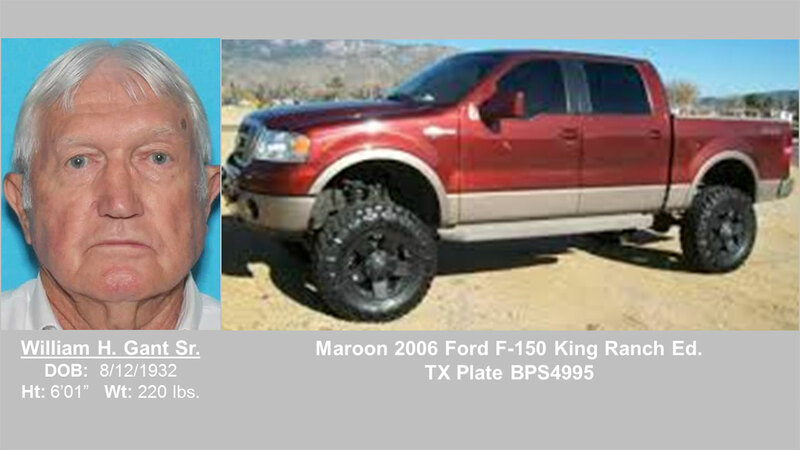 Authorities say he was driving a maroon Ford pickup truck with the Texas license plate BPS4995. The 83-year-old stands 6 feet, one inch tall, weighs 220 pounds and has grey hair and brown eyes. Gant has been diagnosed with a cognitive impairment. Officials believe his disappearance poses a credible threat to his health and safety. Anybody with information about Gant's whereabouts is asked to contact the Hardin County Sheriff's Office at 409-246-5101.